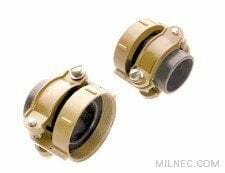 The QS Series of connectors is built to MIL-DTL-22992 QWLD standards and will meet or exceed all of the specifications for performance and durability. 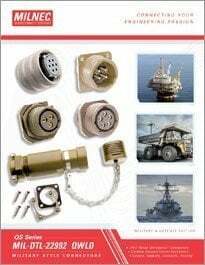 QS connectors are made for power and control applications in extreme environments where standard connectors cannot survive. They are moisture and explosion proof with resilient inserts for protection against shock and vibration. 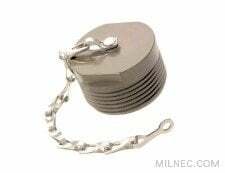 Double stub threads offer quick coupling and easy cleaning. 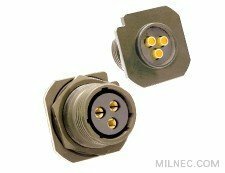 A large selection of mil-spec style and industrial crimp and solder contact arrangements makes QS Series connectors the ultimate interconnect solution for harsh environments. 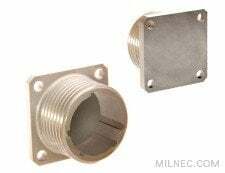 For additional help in specifying your MIL-22992 connector solution, please contact a Milnec sales professional, or your authorized distributor for technical and sales support. 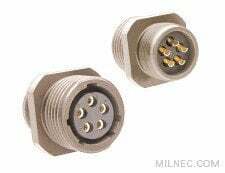 This MS17344 style plug mates with all MIL-DTL-22992 QWLD receptacles. It features a heavy-duty shell for protection in extreme environments. A strain relief backshell is required, and a protective cover is recommended to protect the connector and contacts when it is not mated. The QS00 (MS17343 type) wall mount receptacle features a four-hole flange for easy mounting to a panel. Accessory threads on the back of the receptacle accept protective backshells if required. A cover is recommended to protect the contacts when the receptacle is not in use. The MS17347 style jam nut receptacle features a single-hole mounting design with an integrated O-ring, making it the best option to maintain the environmental integrity of your enclosure. Rear accessory threads accept protective backshells. A cover is recommended to protect contacts when the receptacle is not is use. The MS17348 style jam nut receptacle features a single-hole mounting design with an integrated O-ring, making it the best option to maintain the environmental integrity of your enclosure. 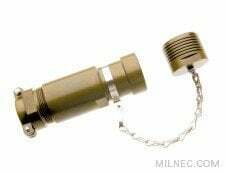 A low-profile rear design that does not accept protective backshells enables the connector to be mounted in confined spaces. A cover is recommended to protect contacts when the receptacle is not is use. 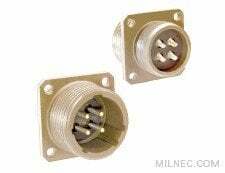 QS02 box mount receptacles (MS17346 type) are compatible with all QWLD plugs. The box mount receptacle features a low-profile design that does not permit the use of backshells, making it ideal for confined spaces. 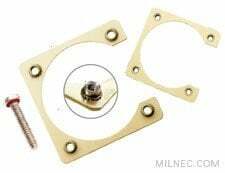 A gasket and a mounting bracket with sealing screws are recommended for a reliable installation. 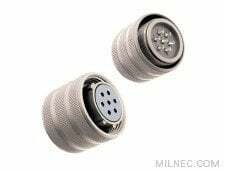 Protect MIL-DTL-22992 QWLD connectors by providing strain relief from the cable or wire bundle. Strain relief backshells should only be used in clean, dry applications. For complete protection, upgrade to a MIL-DTL-22992 compatible environmental backshell. The environmental backshell is the best choice for all applications that demand the ultimate in protection from water, dirt, dust, and moisture. 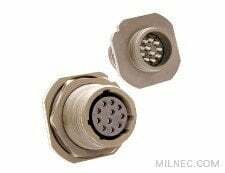 Sizes are available for all MIL-DTL-22992 QWLD connectors. 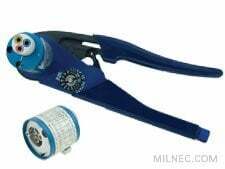 For proper sealing, please order the clamp size best suited to fit your outside cable diameter. 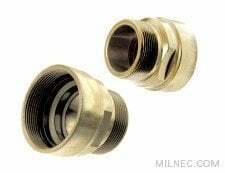 Protect your MIL-DTL-22992 connectors and contacts from damage and environmental exposure by covering them when not in use. The inner gasket provides environmental sealing while the wire rope attachment keeps the cover close at hand. 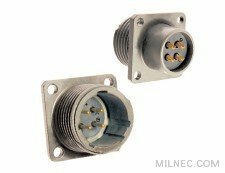 These stowage receptacles are designed for use with all MIL-DTL-22992 connectors. They prevent operator injury or connector damage by providing a safe place to stow and organize your unused cables. Protective covers are also recommended to keep stowage receptacles clean and dry. MIL-DTL-22992 style mounting gaskets will seal the space between receptacles and a panel to maintain the environmental integrity of your enclosure. They may be used in either rear or front mount receptacle installations. 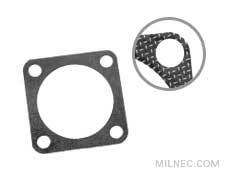 Mounting brackets designed for MIL-DTL-22992 connectors feature captive stainless steel locking nuts that prevent loose fasteners from falling into susceptible areas, which may cause equipment failure. Optional sealing screws with O-rings will effectively seal the mounting holes on your enclosure from water ingress. 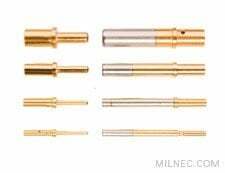 The QS Series offers replacement crimp contacts in sizes #0 to #16 that are fully compatible with MIL-DTL-22992. In addition, all the related tooling is available, including insertion and removal tools and crimpers and positioners.